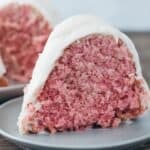 This strawberry bundt cake is a scratch cake made with real strawberries. 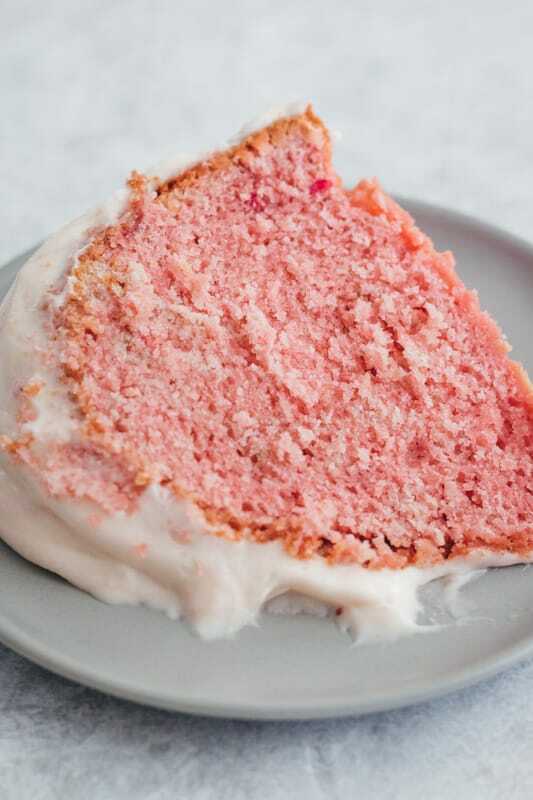 It’s a wonderfully moist cake with a light strawberry taste, then covered with a delicious strawberry cream cheese glaze. There’s no overpowering fake strawberry taste with this one…just a lovely real strawberry flavor. One of the main reasons I love this cake is that it uses actual strawberries. We’re not using a box cake here…this strawberry cake is from scratch. I’ve had some strawberry cakes in my lifetime that were just overly sickly sweet and had a really fake, over the top strawberry flavor. This cake isn’t one of those. The strawberry flavor in this cake is on the lighter side WITHOUT that fake strawberry taste. You’ll be using cake flour for this cake. I really like how cake flour makes the texture so much softer. Strawberry yogurt is used as well to give it a bit of moisture and to impart even more strawberry flavor. Of course we’ll be using real strawberries. I used frozen, because frankly they’re easy to find and easy to handle. You’ll just defrost them overnight in the fridge before you puree them. 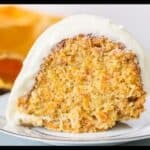 The mixing method for this cake is the reverse creaming method. I used this method in some of my other cakes. You might be used to the regular creaming method, but I promise this is not hard to do and frankly I find it easier. You’ll use less bowls for sure. This method will get you a softer textured cake. And don’t worry, I explain the process in the actual recipe. Do I have to use strawberry extract? No, but you’ll get more strawberry flavor if you do. This batter makes a large amount, don’t use a pan smaller than a 10″ bundt pan (or two, 8″ round cake pans). I haven’t tested this cake as a layer cake, but it should work fine baked in two, 8″ round cake pans that are 2″ deep. There may be a bit more batter than you need, so be careful when filling your pans. You will need to watch your baking time as well because it will likely take less time to bake this cake in two, 8″ pans. Start checking around 40 minutes or so. I used sliced frozen strawberries that I defrosted overnight in a strainer. In order to get 1 1/4 cups of pureed strawberries, you’ll need to put around 2 1/2 – 3 cups of frozen sliced strawberries in your strainer. When you puree them, you’ll get around a cup and a half. Make sure your butter is slightly cooler than room temperature. If you hate the idea of almond extract, just skip it. If you’re making this cake into a layer cake and want buttercream to cover it instead of a glaze, check out my Cream Cheese Buttercream recipe and add in the reserved 2 tbsp strawberry puree, plus a teaspoon of the strawberry extract to get strawberry cream cheese buttercream. 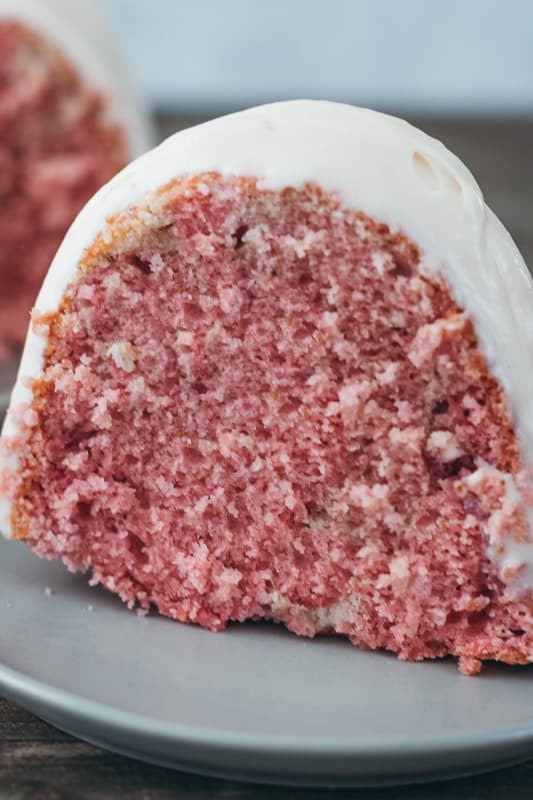 This strawberry bundt cake is a scratch cake made with real strawberries. 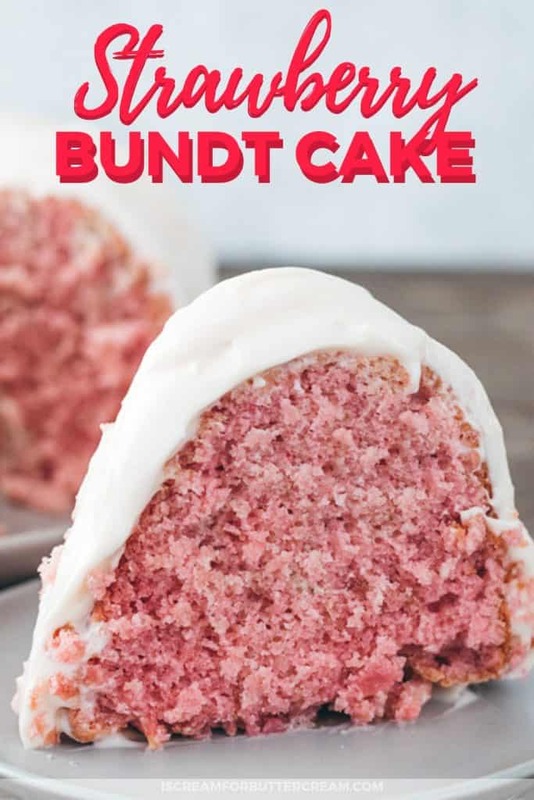 It’s moist, with a light strawberry taste, then covered with a delicious strawberry cream cheese glaze. Grease and flour a 10-12″ bundt pan very well. To a large mixing bowl, add the flour, sugar, baking powder and salt. Mix well. 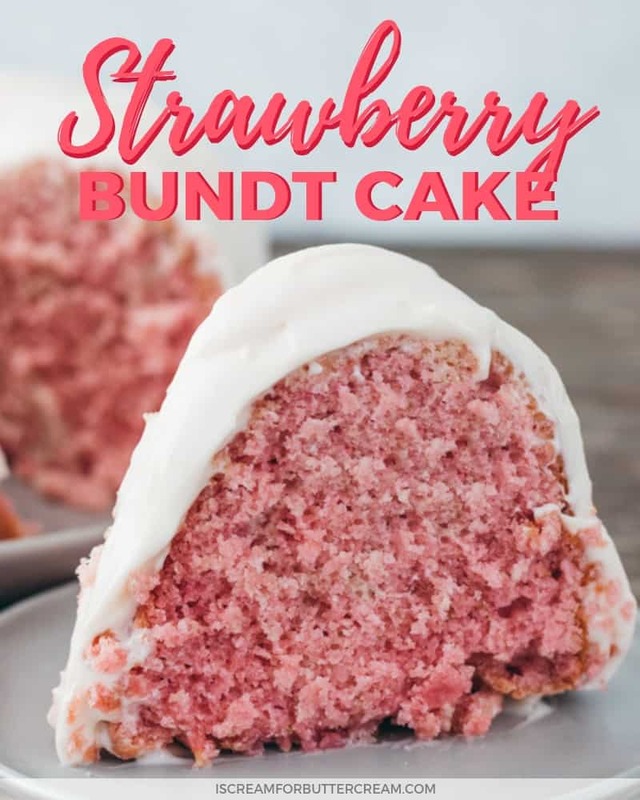 In another bowl, combine strawberry yogurt, strawberry extract, vanilla extract, almond extract, eggs and pureed strawberries (minus the 2 tbsp for the glaze). Mix well with a whisk and set aside. Make sure your butter is slightly cooler than room temperature. Turn your mixer on low and add in the butter (in chunks) slowly to your dry ingredients. Mix on low to medium until all the flour is coated with the butter and the mixture is crumbly (kind of like sand). Pour in the rest of the liquid mixture and mix again until just combined. Add in a tiny amount of red or pink food coloring if desired, scrape down the sides of the bowl and mix again, just until combined. Be careful not to overmix the batter. Mixing it for several minutes is too long. Once all the ingredients are incorporated well, stop mixing. If the food coloring isn’t mixed in well enough, mix it by hand the rest of the way with a rubber spatula. Pour into the prepared bundt pan and bake at 325 degrees for approximately 50-55 minutes. Set on a wire rack to cool for about 20 minutes, then turn the cake out onto the rack and let cool out of the pan completely before adding glaze. Add the butter and cream cheese to a mixing bowl and mix on medium speed until well mixed and creamy. Add in the extract, one tbsp of strawberry puree and two cups of the confectioner’s sugar. Mix on medium until well mixed. Add in the last cup of confectioner’s sugar and another tbsp of strawberry puree and mix well. Add in about three tablespoons of milk and mix well. Scrape down the sides of the bowl and mix again. Check your consistency. Since this is a glaze, it should be thinner than buttercream, but not so thin that it completely runs off the top of the cake. Spoon the glaze over the cooled cake. You can also add the glaze to a squeeze bottle for easier application. 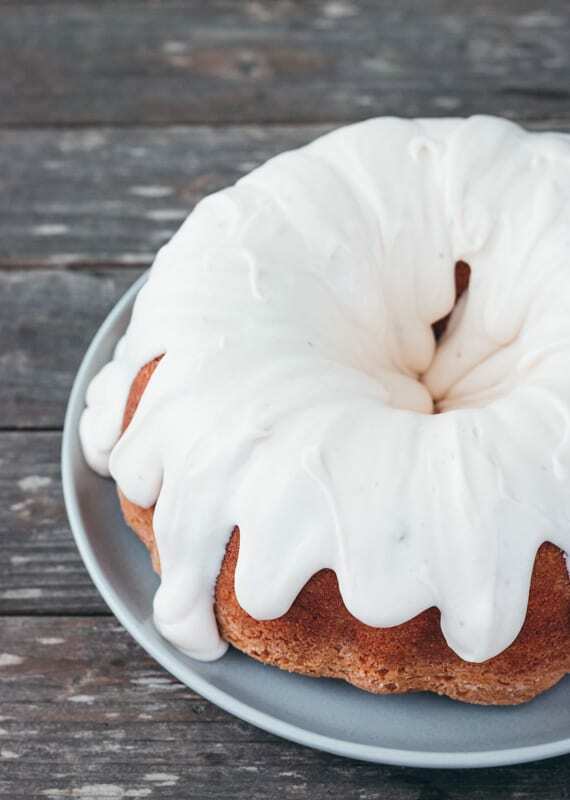 This cake will need to be kept in the refrigerator, if you use the cream cheese glaze. If you’re baking this in two, 8″ round cake pans, there may be a bit more batter than you need, so be careful when filling your pans. You will need to watch your baking time as well because it will likely take less time to bake this cake in two, 8″ pans. Start checking around 40 minutes or so. 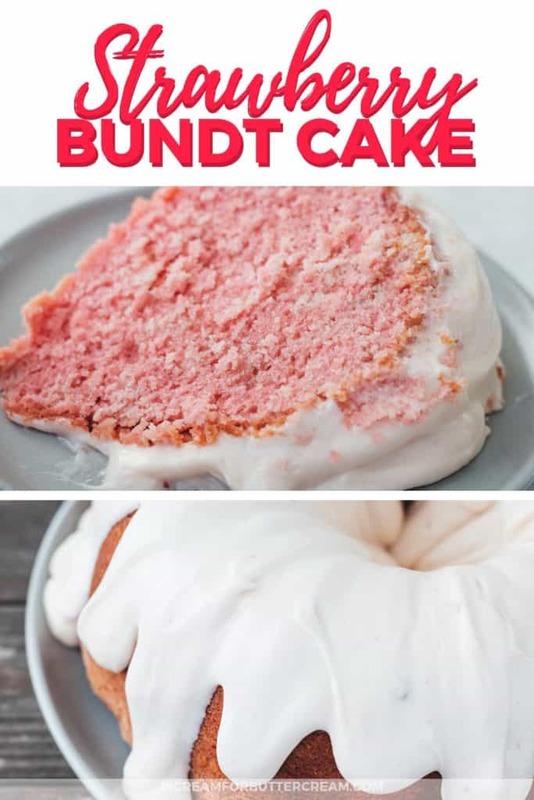 If you want buttercream to cover it instead of a glaze, check out my Cream Cheese Buttercream recipe and add in the reserved 2 tbsp strawberry puree, plus a teaspoon of the strawberry extract to get strawberry cream cheese buttercream. Nutritional information for this cake is an estimate. Make sure to check out the FAQs for this cake in the blog post. GET THE FREE DESIGNED PRINTABLE RECIPE CARD FOR THE STRAWBERRY BUNDT CAKE PLUS THE PASSWORD TO THE RESOURCE LIBRARY. Just fill out the form below! Hi! do you think this could be made into cupcakes? I haven’t tried these as cupcakes, but I’m thinking it would work. I’d try baking them at 350 degrees (rather than 325 for the bundt cake) and then start checking them at about 20 minutes.